What a fun way to serve drinks at a beach or pool party! Just fill with ice and canned drinks and your set to go! 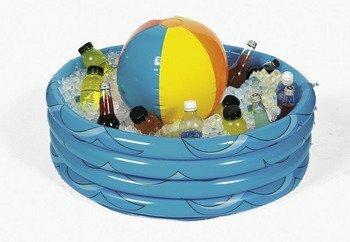 So colorful and fun, this pool-shaped vinyl cooler adds a decorative touch as it keeps your beverages cold! Inflated, 28". So colorful and fun, this pool-shaped vinyl cooler adds a decorative touch as it keeps your beverages cold! If you have any questions about this product by FEX, contact us by completing and submitting the form below. If you are looking for a specif part number, please include it with your message.